A client called to say that their BT Infinity broadband wasn’t working. 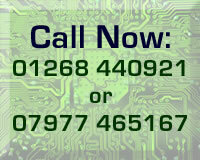 They had spent a considerable time on the phone to BT technical support without any resolution. This sort of problem is very hard to diagnose over the phone; you need to actually be there to troubleshoot these problems. I visited the client and tested the PC, then the Home Hub, then the Infinity box. They seemed to working correctly but there was still no internet connection. I checked their internal wiring (phone sockets and BT Infinity socket) and that appeared to be in good condition. My diagnosis was that there was a problem with the BT line outside the property. They called BT who informed them that there was a charge of over £100 to have a BT engineer come out, but they wouldn’t have to pay the charge of the problem was outside the home. I was confident that it was a problem at BT’s end, so the client agreed and booked the BT Engineer visit. The client later informed me that it was a problem at BT’s green box in their street, which BT fixed free of charge, and the internet is working properly now. My charge was less than the BT Engineer would have cost, so the client saved money by calling me in. My advice is, if you have an internet problem, call me in to troubleshoot and don’t waste your time with calling BT (or Virgin, TalkTalk, or whoever). I will identify and fix the problem if it’s a problem at your end, or advise you to contact your provider if the problem is at their end. It will save you time, money, and hassle.